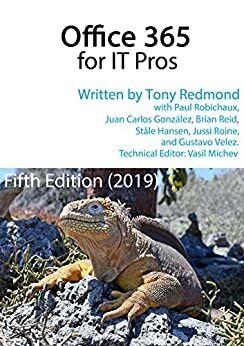 EPUB and PDF versions of Office 365 for IT Pros (main book). EPUB and PDF versions of Office 365 for IT Pros (companion volume). All updates issued for the edition you buy. The current book is the 2019 edition. The price for the full book is $49.95 and can be bought here. Distribution of our book is handled by Gumroad.com based in San Francisco, CA. When you purchase from Gumroad, please make sure that you create an account on the site (sign up with a username and password) as otherwise you won’t be able to fetch updates when we release new files! We have no control over how and when Amazon notifies customers that updated files are available. We do prompt them from time to time, but then it’s up to Amazon to make the call whether to notify customers. If you only want to buy the PDF version of the book and don’t care about getting the updates as we release new files, you can buy the PDF version of the book (including the companion volume) for $29.95. No updates are included in this purchase.